"Although modern, monocrystalline silicon solar cells achieve slightly better values, they are much harder to manufacture, and they have been under development for a much longer time," says Dr. Paul Pistor, a physicist at MLU and lead author of the study. Currently, however, there are no market-ready perovskite-based solar cells as there is no established process for the large-scale production of perovskites. In addition, the thin crystal layers are unstable and sensitive to environmental influences. "High temperatures or humidity cause the perovskites to decompose and lose their ability to convert sunlight into electricity," says Pistor. Yet solar cells have to withstand elevated temperatures because they are permanently exposed to the sun. In their study, the physicists from Halle investigated a special, inorganic perovskite consisting of caesium, lead and bromine or iodine. Instead of using the usual wet chemical processes to produce the perovskites, they deployed a process that is already widely used in industry to produce thin layers and a range of components. In a vacuum chamber, precursor materials are heated up until they evaporate. Then the perovskite condenses on a colder glass substrate and a thin crystalline layer grows. "The advantage of this method is that every part of the process can be very well controlled. This way, the layers grow very homogeneously, and the thickness and composition of the crystals can be easily adjusted," explains Pistor. 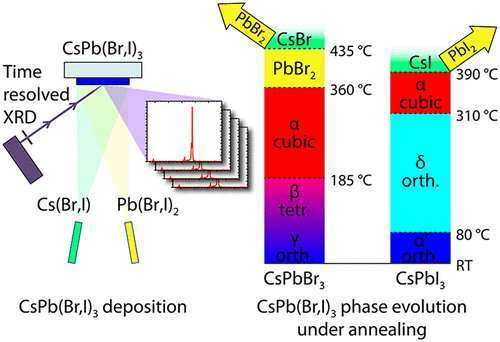 His team was thus able to produce perovskite layers based on caesium that didn't decompose until they reached temperatures of 360 degrees Celsius. Using cutting-edge X-ray analysis, the researchers also analysed the growth and decay processes of the crystals in real time.